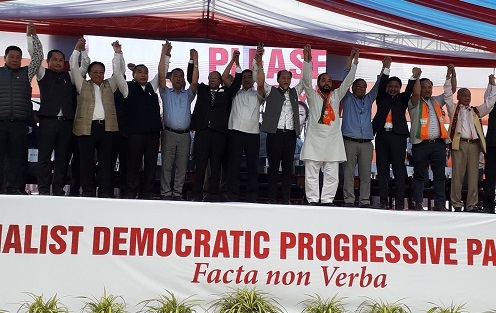 The ruling People’s Democratic Alliance (PDA) in Nagaland kicked off its campaign for the Lok Sabha poll here on Tuesday, promising to continue development works in the State and protect the rights of the Nagas. The alliance, comprising Nationalist Democratic Progressive Party (NDPP), BJP, National People’s Party (NPP), JD (U) and an Independent, fielded its consensus candidate and sitting Lok Sabha MP Tokheho Yepthomi for the lone Lok Sabha seat in the State. Yepthomi is from the NDPP, the major partner of the PDA. Addressing the launching of the campaign at Dimapur District Sports Complex stadium, Nagaland chief minister Neiphiu Rio said the ruling alliance in the State started work on the election promises after taking over the rein of the government last year. He asserted that the State government is pursuing the commitments made before the 2018 Assembly elections with Dimapur and Kohima as priority. “Let the 4-lane work on NH 29 between Dimapur and Kohima complete. Development of all town roads and district headquarters will be taken up equally,” Rio assured. He said nine to 10 State departments received national awards in the last one year while Nagaland was awarded the ‘Best Performing Small State’ in ‘Law and Order’ category by the India Today State of State’s Survey 2018. “This was possible because of the peaceful atmosphere and development works in the State,” he said. Rio said Prime Minister Narendra Modi’s image got further boost after the surgical strike in Pakistan following the Pulwama terror attack and release of IAF pilot by Pakistan, one day after his capture. He exuded confidence that the BJP government would come back to power and added that only the BJP can settle the Naga political issue. He said after BJP-led government came to power at the Centre in 2014, it signed the framework agreement with the NSCN (IM) on August 3, 2015. On Citizenship (Amendment) Bill, 2016, Rio said it is a matter of concern for the whole of the northeastern region. He, however, said the PDA is firm that the Article 371 (A) of the Constitution can protect the rights of the Nagas even if the Bill is passed. Rio said the Opposition, Naga People’s Front leadership is “confused” and fighting among themselves over fielding of candidate for the Lok Sabha seat. “While one group is for fielding a candidate of its own, another group is for backing the Congress candidate,” he alleged. It will be a shame if the NPF, which has 26 MLAs in Nagaland, backs the Congress party which does not even have a single MLA in the State. In his address, PDA candidate Yepthomi said the Naga talks did not progress during the previous UPA regime. It was only after the BJP government came to power that the framework agreement with the NSCN (IM) was signed. He said the Parliamentary Standing Committee formed by the NDA government on the Naga issue submitted its report in the Parliament, which said the talks were in advanced stage. The committee suggested the government to pursue the negotiations for settlement of the issue. “If the Nagas want settlement, they must be with the central government,” the Lok Sabha MP said, suggesting that BJP is set to return to power at the Centre. Deputy chief minister and state BJP leader Y. Patton among other leaders of alliance partners also spoke on the occasion.